Trout-lily are a true spring ephemeral with thier leaves dying back shortly after the forest canopy is leafed out. This monocot belongs to the genus Erythronium and as its common name implies is a member of the lily family. John Burroughs, American naturalist, offered the name fawn-lily or trout-lily as an alternative to to the less attractive name of adder’s tongue, feeling the flower was much too beautiful for this name. In fact, the trout-lily is perfectly at home along trout streams while its leaves are reminiscence of the mottled look of a trout’s back. To the joy of the pollinators that visit the yellow flowers deer do not favor eating the leaves of trout-lily. The same can’t be said of other spring ephemerals that suffer from over browsing. On cold or cloudy days the flowers remain closed but burst open on warm sunny days welcoming a diversity of spring bees seeking both pollen and nectar. Numerous bees visit the flowers including queen bumble bees (Bombus spp. ), many species of mining bees (Andrena spp. 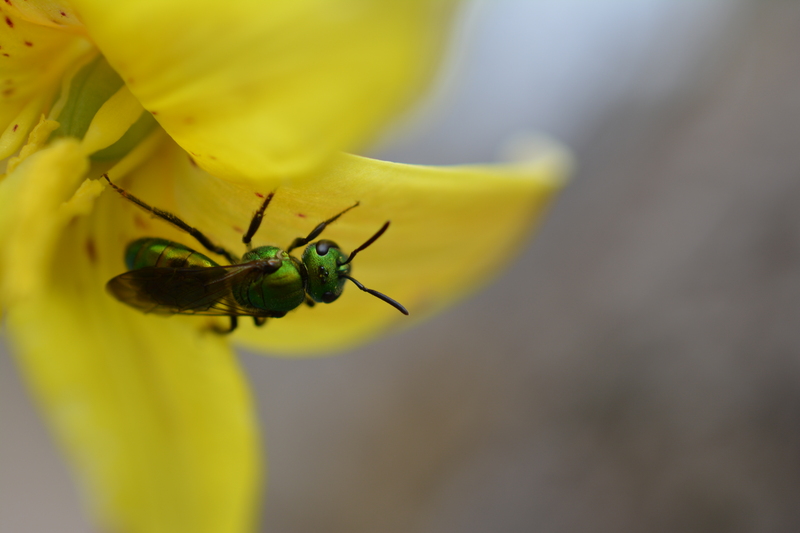 ), green sweat bees (Augochlora spp.) and species of “cuckoo bee” (Nomada spp.). A variety of other pollinators also visit them including bee flies and pollen eating beetles. Bees usually remove half of the available pollen in one visit, often spending a good amount of time at a flower. Bees will often stop to rest and groom pollen from thier fuzzy bodies onto thier scopae hairs on thier legs or pollen baskets. The trout-lily depends on insect pollinators for sexual reproduction. Since spring weather can often be unpredictable plants also spread through vegetative reproduction. This allows genetically identical plants to spread over a given area. Plants that grow in this manner tend to have few flowers in a given year. The seeds that are produced through cross pollination have an unusual means of disperal, that is common among spring ephemerals. The seeds contain elaiosome on one end that is attractive to ants who carry them back to their homes. Ants disperse at least 25% of the seeds in this manner. The seeds wait to germinate in the fall after the ants change nest sites. The seeds tend to have good germination rates producing one leaf the first year and two leaves in subsequent years. It takes a new plant four to seven years to blossom if conditions are favorable. Take a moment to enjoy the fields of trout lily growing in untouched woodlands and watch for the many pollinators that come to enjoy all the flowers have to offer.